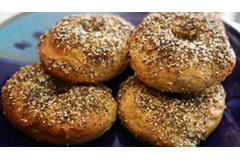 DESCRIPTION: New York City isn’t the only place to get authentic bagels. The truth is, you can make bagels that are just as good at home! Join us in creating and shaping the perfect dough into delicious, chewy bagels. We'll even help you out with ideas for toppings and schmears too.